My personal life has quietened down dramatically the last couple of weeks and I’ve been hit with Bookish Inspiration which is amazing as I was due to start blogging in October and I’m quite early so instead of sitting there twiddling my thumbs I thought I’d get right on it and return to blogging! I’m determined to not let everything get so far on top of me again that I feel like I’m drowning in emails and reading. I’m going to take things at my pace and if that means one blog post a week then that’s what I need to start with. I haven’t blogged here for the better of a year and in that time I’ve lost a lot of readers. I lost my commitment to book blogging when I started my job last year and although I tried to keep it up and be constant it was quite a hard adjustment for me. 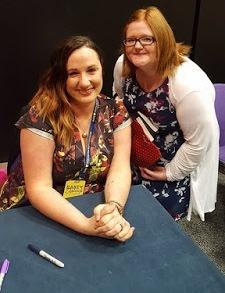 In the last month I’ve been reading a blog where the posts are passionate about books and where this girl gets so excited that her favourite author tweeted her that she shared it with the world (or tried to) That blog has given me inspiration. I’ve given myself inspiration because the blog I’ve been reading is mine.. from the very first post ever published to the latest one I’ve noticed where the posts started dwindling and started getting more like a full-time job. I have a full-time job. I would really not like another one! I’ve also changed quite a lot since I started blogging.. at the start it was about just having a place to share my love of books and then it started feeling like a competition with myself about gaining followers, comments and not feeling popular enough on the web… which is basically all crap to put it bluntly! I’ve went on so many blogging breaks, I’ve re-designed my whole blog, I’ve changed the name of the blog! Well now enough is enough because it’s not about the actual cover anymore but about the content! All that is left to do is actually blog! What blogs do you enjoy reading? What is your favourite thing to read about?